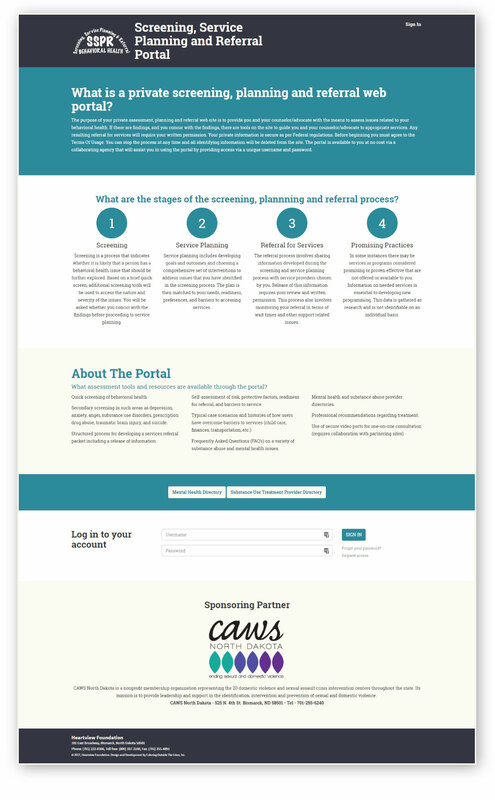 A screening tool for behavioral health needs assessment. Heartview Foundation looked to Coloring Outside the Lines to build a fully custom screening tool to cover all areas of behavior health using research-based testing methods to rate and score a patients potential needs for behavior health services. We built a completely custom HIPAA compliant web application with user states for administration, provider location, screening counselor and the prospective patient. We worked extensively on the full UX of this platform, starting with scoping and investigating users types and personas, then moving into a complete functional specifications and user interface design prior to coding the site with 4 user types and custom portals for each user. Features on this portal include: over 10 custom tests that are automatically scored with recommendations, user and counselor commenting, custom login, intuitive dashboard for user progression, custom lists tied to service planning and resources.